Wine Choices and Wine Calories. A wine vlog about options and opportunity cost. With information about the calories in wine and alcohol nutritional labels. 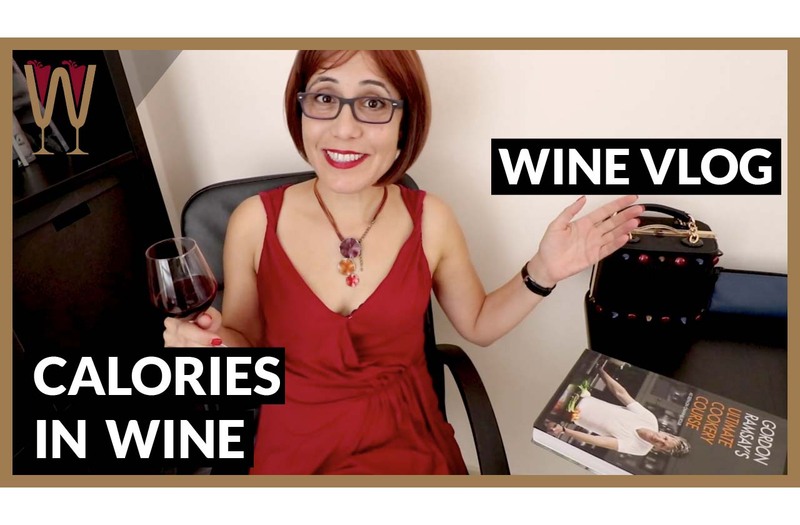 Find out more about the calories in wine, and enjoy the presentation! Hey Tasters! I love nothing more than losing myself in the pages of a cookery book. Right now, I’m reading Gordon Ramsay’s Ultimate Cookery Course and I’ve come across this recipe ‘griddled pineapple with spiced caramel’ I mean what wine would pair well with this? Excuse me… Ah, okay, so my friend George is asking me to meet him for coffee. That sounds really tempting actually. I’ve not seen George in a while, but here’s my problem. The fridge is empty! And I mean really empty. I was planning to go to the supermarket, and I really don’t think I can afford to meet George for a coffee now. Let me show you, and then you’ll see what I mean. This is my fridge right now. Have a look at this: Worcester sauce, pinot noir, spreadable Irish butter with olive oil, some Lindt chocolate, of course, and water. That’s the fridge, that’s all of my supplies. I really, really need to go to the supermarket, it’s not optional. Many years ago I took an introductory course in economics. I was fascinated by the idea of opportunity cost, and I always, always think about it whenever have a choice to make. Basically, it comes down to this: our resources whether it’s money or time are limited, so when you divert your resources to A then option B immediately stops being available. So every choice we make involves choosing something over something else. We cannot have everything. And this is just a really complicated way of saying I am going to do grocery shopping rather than have coffee with George. I’m really excited about this one. It’s Cabernet Sauvignon and Syrah. It’s a Greek wine. I believe this will taste really quite rich, but what’s really interesting is that the alcohol level is quite high. Fourteen percent. The higher the alcohol, the more the calories, but I’m really tempted so thing I’ll have this. I really want to taste that wine with my lunch. At 14 percent alcohol it’s a little bit higher in calories than average, but I’ve just thought of something. One of my closest friends has just gone on the Keto Diet. One of the things she’s been doing is swapping cauliflower for potatoes. Mashed cauliflower instead of mashed potatoes, and that apparently has saved her a bunch of calories, because it’s much, much lower in carbohydrate. So, I will try that, that’s my compromise solution. Mashed cauliflower instead of mashed potatoes, and I’ll enjoy this wine for lunch. Of course, I’ll have mashed potatoes tomorrow with something lighter. This has just reminded me of a joke. What Bob Marley’s favourite donut? Leave your best guess in the comment section below. Here’s your clue. Hey guys, so I couldn’t resist this wine while I was at the supermarket, and at least part of it is that beautiful label with the pulsing Ruby Heart. I am eager to try this because from what I can see here there is a local grape in it called Limnio, but it’s also a blend with Cabernet Sauvignon and Syrah. It spent 12 months in French oak. The soil is sandy and clay soil. There is every indication here that be the taste is going to be rich and satisfying, so this is going to be my taste for the week, and I’ll let you know how I’ve enjoyed this. I decided on the spur of the moment to substitute cauliflower for mashed potato, to do that to save some calories on the recommendation of a friend and, it’s just occurred to me as I was driving back that actually, I am not entirely sure how many calories are in wine. So while I’m preparing my lunch I’ll look this up and I’ll get back to you with a little bit of information about calories in wine stay tuned. Hey Tasters. I’ve just finished preparing my lunch and I’ve made cauliflower mash instead of potato mash, and that means I’ve saved quite a lot of calories, and I can enjoy one or even two glasses of this high alcohol, super rich, super fruity Greek wine. Life is all about choices and I’ve been thinking a lot about wine and wine nutrition and wine calories today. Have you ever noticed that there are no nutritional labels on wine bottles? Look at that. No other packaged product meant for human consumption that I can think of comes with no labels. It’s only just occurred to me today, so I thought I want to look into that. Now I have found a bunch of resources, and I’ll link them all below if you want to delve deep into this. The short explanation is this, and I found this a little bit amusing. As it turns out, this is a hangover, if you’ll excuse the pun, from the Prohibition era. The FDA never actually controlled alcoholic drinks. They didn’t come under its jurisdiction because they weren’t supposed to exist. So when they finally became legal again to consume, they came under the jurisdiction of the alcohol and tobacco tax bureau. The FDA that requires labelling doesn’t actually control most alcoholic drinks. As I said, I’ve got a bunch of links for you guys and I’ll leave them in the description below. But that did amuse me, in trying to control alcoholic drinks so hard they completely lost control over them. There’s a lesson there I believe. Anyway back to wine and calories. There is no labelling information, however were not completely in ignorance of how many calories are in a wine glass. Whether you prefer red or white or rosé wine, a normal serving of about 150 millilitres will have between 120 and 150 calories. Back to choices, back to opportunity cost, what do a hundred and fifty calories look like? They look like this: three Oreo biscuits, or 30 grams of Pringles, or half a Bounty chocolate bar or a fun-sized Bounty chocolate bar. That’s nice, but I would rather have the wine. Hey guys, I don’t know what happened with the audio just then, but I was looking back at the footage and the audio is gone. And, under different circumstances I would have redone that scene but that was actually my lunch, and I’ve eaten it, and lovely it was too, and there’s none left. So I cannot redo that scene, sorry about that guys. This wine has opened up nicely. It’s been sitting for about 40 minutes now, all the fruit is coming up, the tannins have mellowed down, it’s absolutely gorgeous. So I’m going to sit here and digest my lovely lunch. I have a date with Gordon Ramsay, and let me tell you he’s much nicer in print than he is on television. Thumbs up if you’ve liked this video and I’ll see you next week. Where’s the Alcohol Nutrition Label? Ask a Dietician: Where is the nutrition label?